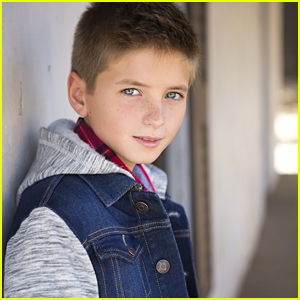 We’ve Got 10 Fun Facts Why You Will Fall In Love With Salem’s Oliver Bell | 10 Fun Facts, Exclusive, Oliver Bell | Just Jared Jr.
Oliver Bell is one in-demand young actor! He’ll be starring on both WGN’s Salem, as Little John, the long-lost son of Mary and John AND on HBO’s new series, Westworld. 1. Should I follow my dad and grandad into the sport, I would be the third generation of champion race car drivers. But they seem happier that I am acting, as it’s less dangerous and expensive than racing. 2. Outside of school, my favorite things to do are: art projects with my dad, running with my mum and being on the ski team at Mammoth. 3. I have never lived in England although I have a British accent. I was born in Florida and until I was about 6 I had more of an American accent, but then one day I decided I wanted to sound like my dad. 4. I love traveling – For Salem, my mum, sister and I lived in Shreveport, Louisiana to film the show. There are so many other places in America I want to visit, as well as attend more races with my dad. 5. I have a younger sister named Tallulah, who is the funniest girl I have ever met and would love to work with her one day! 6. I wish I lived on a farm. My dad and grandad grew up on a farm and I dream of all that open space and no one telling me what to do all day. 7. My mum’s family are Scottish and I am really proud of that heritage. It would have been fun to be a Scottish kid back a few hundred years ago, as I think you were allowed to carry around a sword, even at 12. 8. When I saw my scenes with Sir Anthony Hopkins from episode 2, I was so impressed about how he is able to connect with the camera. On set he was really focussed all the time. I hope to get many more chances to work with people like him. 9. My very first red carpet was the premiere of Westworld. 10. While filming Salem, they really allowed my character to grow, but without giving away spoilers – he is a pretty dastardly boy. New episodes come out the week of Halloween and if you get scared easily then get ready to scream! I loved my co-stars as I was with them for months and they are like a family to me. Salem season three premieres on November 2nd. Westworld is airing now.